First sentence: "Ethel! For Heaven's sake! Where are you?" 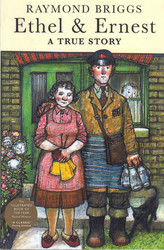 Publisher's Summary: "Poignant, funny, and utterly original, Ethel & Ernest is Raymond Briggs's loving depiction of his parents' lives from their chance first encounter in the 1920s until their deaths in the 1970s. Briggs's illustrations are small masterpieces; coupled with the wonderfully candid dialogue, they evoke the exhilaration and sorrow, excitement and bewilderment, of experiencing such enormous changes. As much a social history as a personal account, Ethel & Ernest is a moving tribute to ordinary people living in an extraordinary time." Reason for Reading: When I found out about "When the Wind Blows" I checked to see if Briggs had any other adult graphic novels and found this one. I was immediately drawn to the topic and requested it through ILL. This is just a simply charming book. Briggs pays homage to his parents in a way I guess we all wish we had the talent to do so. 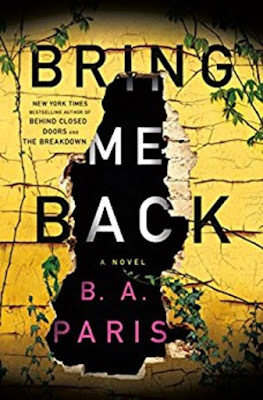 While a biography of his parents, it also includes his own life story as far as it affected his parents, until the time of their death and in a way also shows us what shaped the man Briggs himself came to be. The book shows how heroic ordinary people are just living their normal everyday lives, getting through the tragedies of real life and what an extraordinary time it was to live through the twentieth century with the incredible changes that took place over the span of one person's life. Ethel & Ernest are comic in their straight forward attitude as they take these changes in their stride and comment upon the usefulness or silliness of each new modern invention. Ethel is fascinated with a copper water heater. Just turn a button and light a match! How brilliant! Then we watch a page of frames as she back-breakingly washes her sheets by hand with this scalding hot spray of water. Television? Ridiculous! How awful. It would be like going to the pictures every single night! Once Raymond grows up and starts college as an art student his parents are horrified. He turns into the typical 60's long haired hippie and his mother constantly meets him with "Hello Raymond, Here's a comb." You will fall in love with this peppy, perky couple who worked a hard life of manual labour through the 30s and 40s, survived WWII and the minor bombing of their house, learned to adjust to the modern inventions of the 50s and became baffled by the political and social upheavals of the sixties, of which their son was a part. There is nothing in the book inappropriate for children, the deaths at the end may be traumatic for some, but on the whole, the subject matter is going to be appreciated by a more mature audience. A lovely book that I'm glad to have stumbled upon! I read this a couple years ago and thought it was very well done. Glad you enjoyed it!